The first of the three national parks that we explored in the Southern Andes was the Parque National de Tierra del Fuego, just to the west of Ushuaia. 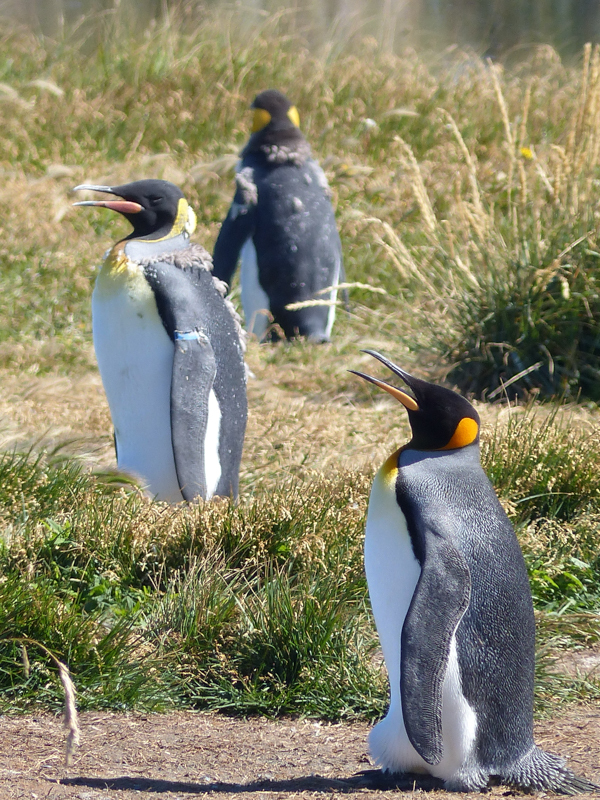 Strictly speaking, the peaks on Tierra del Fuego may not be defined as part of the Andes range, as they are not on the South American continent itself, but geologically they are all one range, that starts even further south with the Antarctic Peninsula – where you could say our Andean adventure really began. The park has several lovely campsites and so we chose to camp at what was reputed to be the best free one (Rio Pipo), which is situated next to the track of a little narrow gauge steam railway (originally built and used by prisoners to collect wood for a remote Argentinian prison in the early 20th Century, now reopened as a tourist line), which provided some entertainment over breakfast. The campsite also has the distinction of having the best portaloos I have ever seen – clean, toilet roll, soap, running water, paper hand towels and still in good nick on the second day! We parked up with Paula and Jeremy of seventeenbysix.com, a couple from London whose blog of their trip south from California we had read before we came out. So it was a pleasure to spend some time with them when they arrived in Ushuaia after 3½ years on the road. They are also in a VW campervan and we sat with both vans surrounded by free roaming horses in the picturesque setting of the park. Most of the peaks around here are only around 1,400m, which is not very high but they all have snow on and come up dramatically straight out of the sea. 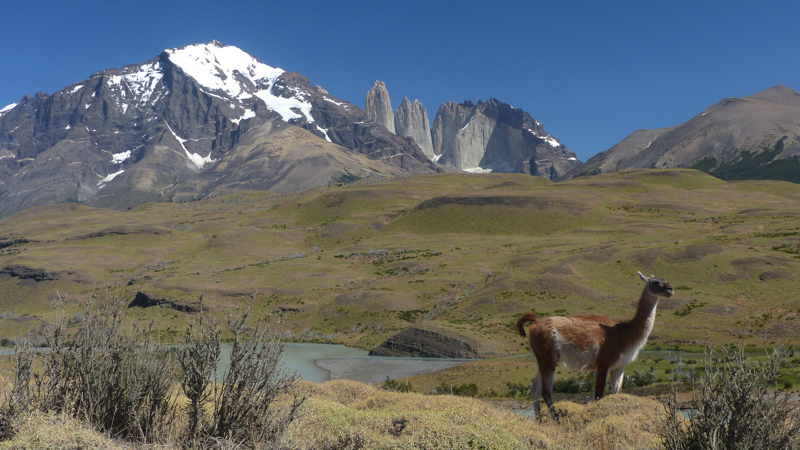 One of the easiest to get up is Cerro Guanaco, which overlooks the campsite. We had been advised to only do the 6km trek up the 965m summit if you can see the top when you get up in the morning. We were lucky and had a beautiful, albeit windy (as always), day giving us fantastic views across the Beagle Canal from the top. 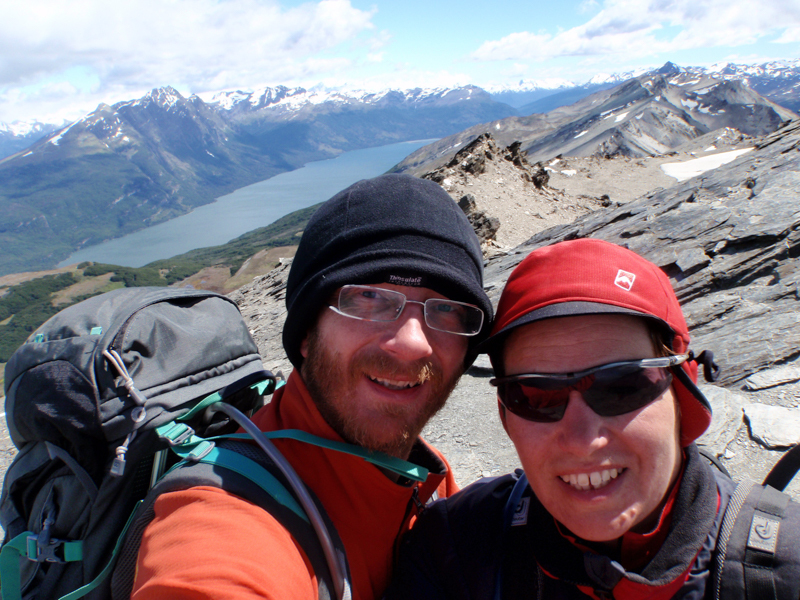 The hike also gave us our first taste of walking in the Patagonian winds, which can be very fierce. We learnt that trekking poles have another use as a walking aide here – bracing yourself against gusts. This felt like a good start to our Andes hiking and we also followed it with a half day of climbing at what is probably the most southerly bolted crag in the world. 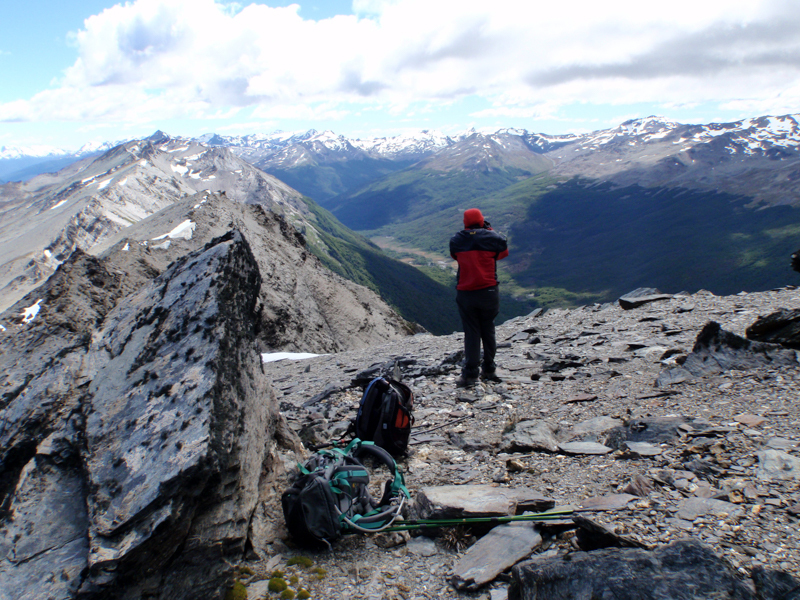 Short, quite tough and overhanging but great views of the Beagle Channel surrounded by snow-capped mountains – a unique cragging experience! As we approached, we could see that we were now starting to see something much bigger and more dramatic – Paine Grande is a smidgin over 3,000m. The Torres del Paine is a range of rock massifs protruding dramatically out of their surroundings. It is also relatively approachable, being right on the eastern edge of the range, meaning that it is now also a huge tourist destination. Many of our fellow passengers to Antarctica went there either before or after the voyage and, at the height of the summer holidays, there were 1,000s of visitors, a few doing a 5-6 day trek circling the entire massif, the majority doing a 5 day ‘W’ trek around the eastern side. That being said, it was good to see that most of the tourists are Chilean, reflecting how well developed the healthy Chilean economy is – indeed it almost seemed like doing the ‘W’ might be some sort of right of passage for Chilean teenagers! Each arm of the ‘W’ is a foray into a valley in, or up the side of, the massif. There are plenty of campsites and refugios, but the refugios need to be booked a long time in advance in summer (impractical for us) and even some of the campsites need places reserving. They are basic but well run and in general, the crowd management of the area is pretty well done. There is very little litter and none of the tissues scattered around that you see in lots of other parts of the world. But you are not able to walk in solitude for any length of time at the time of year we were there! We decided to do two separate treks, involving two two-day hikes, one day in and the other out, to see a couple of the legs of the ‘W’. We started by going up the valley to see the Torres (towers) themselves and then went up the middle arm, the Valle Frances. The Torres were stunning to see, but the walk itself was much less interesting than the dramatic and varied Valle Frances, which gave us stunning views of Paine Grande and it’s glaciers (creaking and cracking all the time) on the west and the Cuernos (horns) on the right. Both walks were a fun introduction to multiday trekking for us and were a good test of our little, previously unused, trekking tent. After a satisfying week or so, we watched the Torres disappear in our rear view mirror as we headed back into Argentina to continue our journey north, stopping on route to visit the Milodon Cave, just south of Torres del Paine, known for it’s fossil remains of a huge ground dwelling sloth, which was around for a while after the last ice age, coinciding with the first human inhabitants, but went extinct about 6-8,000 years ago – another reminder of the glacial forces that shaped Patagonia. 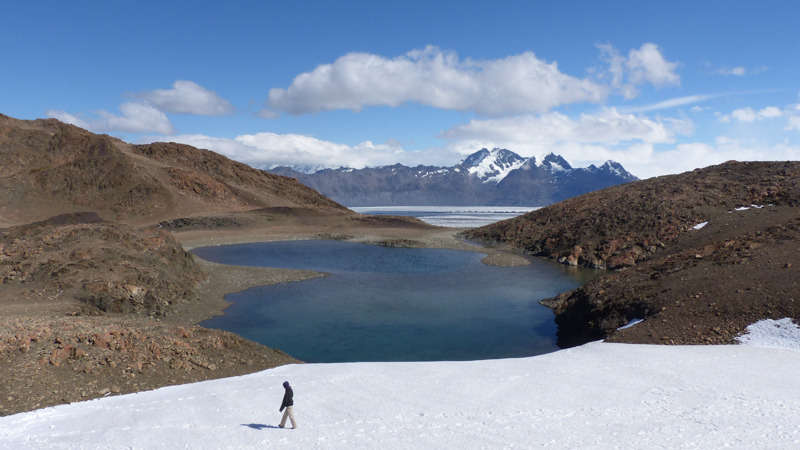 Next we were off to spend a couple of weeks at the Parque National Los Glaciares. 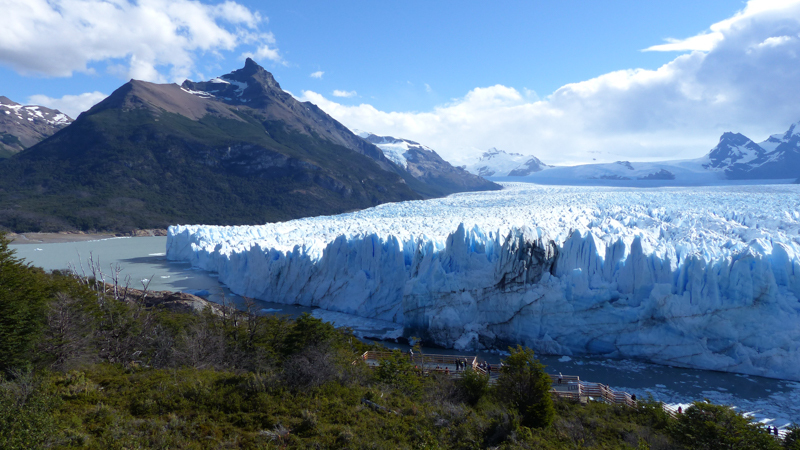 The first few days were spent at the southern end in El Calafate, primarily to go and see the massive Perito Moreno glacier. This is about 6km across the front and, is unusual, because it is advancing, moving about 2m a day into Lago Argentina, making it very active, with frequent “calving” (when bits melt and break off the front). You can get very close to it, as it advances towards a point of land directly opposite, from which there are spectacular views from viewing platforms. The northern part of the park is centred around the small town of El Chalten, which is a kind of a cross between Chamonix in the early days and Camp Four at Yosemite (for those who are interested). 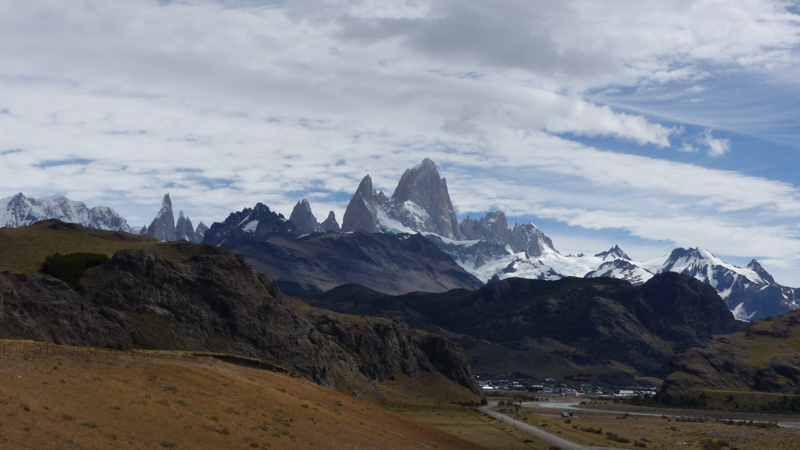 The park here is free to enter and is the gateway to the big boys – Monte Fitz Roy (3,405m) and Cerro Torre (3,102m), which, like the Torres, are sheer rock massifs. The town is very remote, the one petrol pump is solar and wind powered and internet access almost non-existent, but it has a great outdoor feel about it and we stayed for much longer than we expected. There is plenty of trekking, most of it easily done in a long day and we did one one-day walk as a warm up to get close up views of Cerro Torre. Both Torres del Paine and Los Glaciares are on the edge of the massive South Patagonian Icefield, which is only beaten in size by the two Poles. It has a noticeable affect on the weather, making the wind that comes across it rather chilly. The main manifestation of the icefield that most people can see are the glaciers creeping out of the icefield into the lakes. Not having any experience with ice, crampons etc., we took a tourist trip onto one of the glaciers, and it was there, we got a little tantalising view of the icefield behind. Becca asked the guide if there was somewhere reachable by ordinary walkers to see the icefield properly and was told that the Paseo del Viento (windy pass) was the most easily reached place. We needed kit and expertise to do a Tyrolean traverse (a crossing on a suspended rope or wire), which, being rock climbers, we have, but the glacier crossing would be fine in ordinary boots, as the glacier is “dry” and covered in rocks and stones at that point. So, we decided to made that our major trek of our stay here and waited for a “weather window” to do it. We only had to wait one day until it looked like we could catch a clear, fine day for going up to the pass. Overall, the three days were quite long and hard, but well worth it for the view. This was not one of the standard day hikes and so required registration and a (free) permit from the Guardaparque (who were very helpful and a good source of information, although they were at pains to point out that they won’t come rushing to find and rescue us just because we don’t check back in, back from our trek, on time – fair enough really). 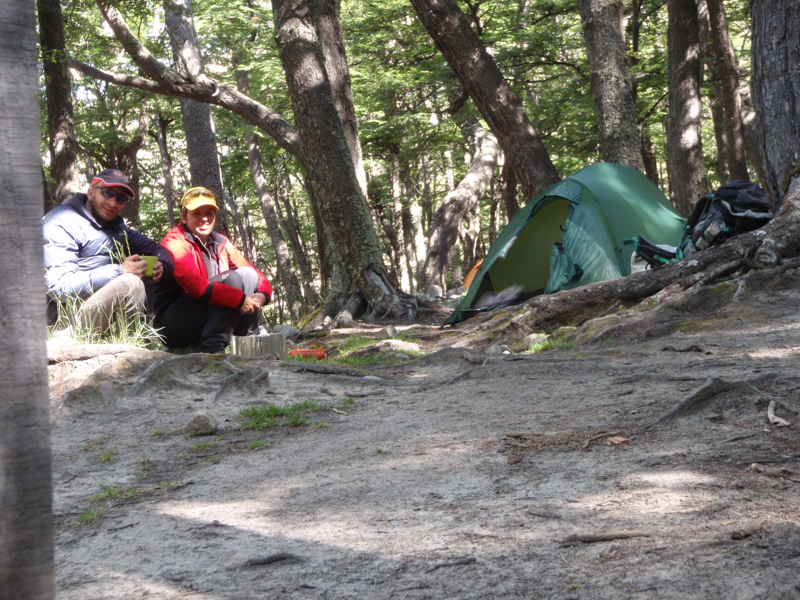 We can also say that we have been inaugurated into the true Patagonian trekking experience having spent two very windy and wet nights squeezed, with all our stuff, into our tent camped by the lake near the top of the valley, either side of the fine day we had going up to the pass! From a climbing point of view, most serious climbers go to Los Glaciares to climb Fitz Roy, Cerro Torre or one of the other imposing rock peaks in the park. However, if you are not such a gnarled and serious a climber, there is also a wealth of cragging and bouldering available within short walking distance of the town, including the 180m long ‘Carsten Route’, which is one of the best sports routes I have ever done! (Made possible by coinciding with the “Hot Rock” overland truck being in town at the same time and lending me a climbing buddy for the route – thanks Callum!) All-in-all, the climbing and trekking managed to keep us there for 11 nights – a record for us on this trip so far. One of the things that all three parks had in common was the flora, fauna and the threats to them. There are only four or five species of hardy trees (mostly beech species) and a couple of bushes (including the famous Calafate) that are found in the Southern Patagonian Andes but they are quite abundant, slow growing and long lived. This makes the landscape quite magical, with their gnarled limbs, but also means that they are extremely vulnerable to damage. 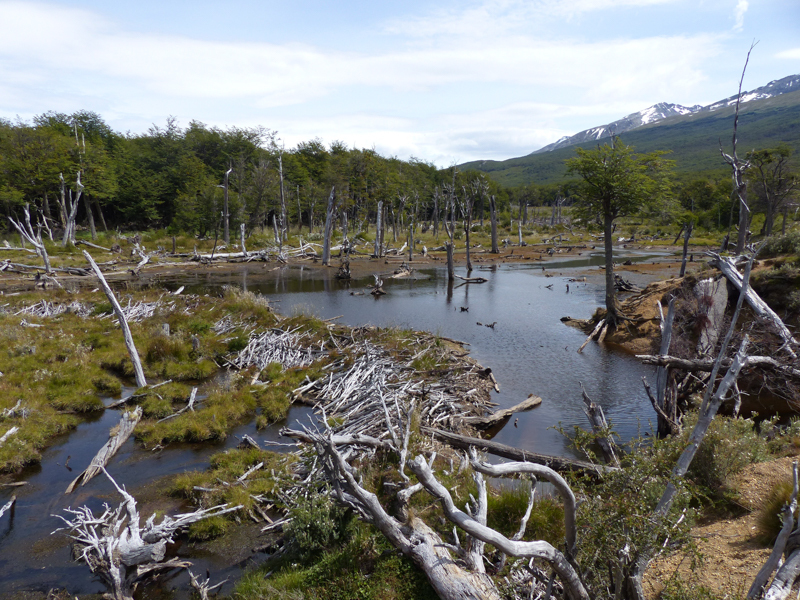 In the 1950s, about 25 pairs of beavers were introduced to Tierra del Fuego, we think with the intention of creating a fur industry, and their damns have devastated many rivers and killed countless trees throughout Tierra del Fuego. 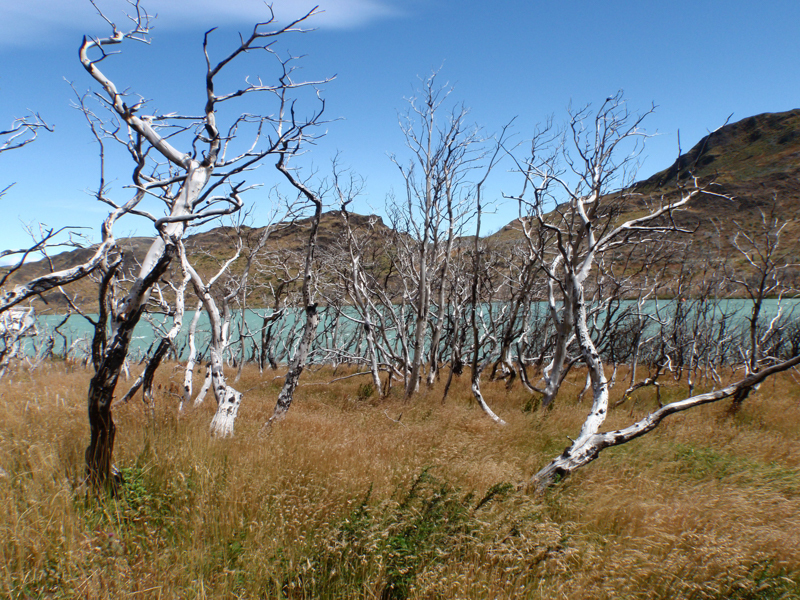 Further north, fire damage is the most significant risk and a number of recent fires caused by trekkers have destroyed swathes of woodland in Torres del Paine. The problem is that the trees are so slow growing that it takes decades for them to get established again and in the meantime what is left is open fields littered with the hulks of dead grey tree trunks. A spermwhale head and jaw – it’s large! 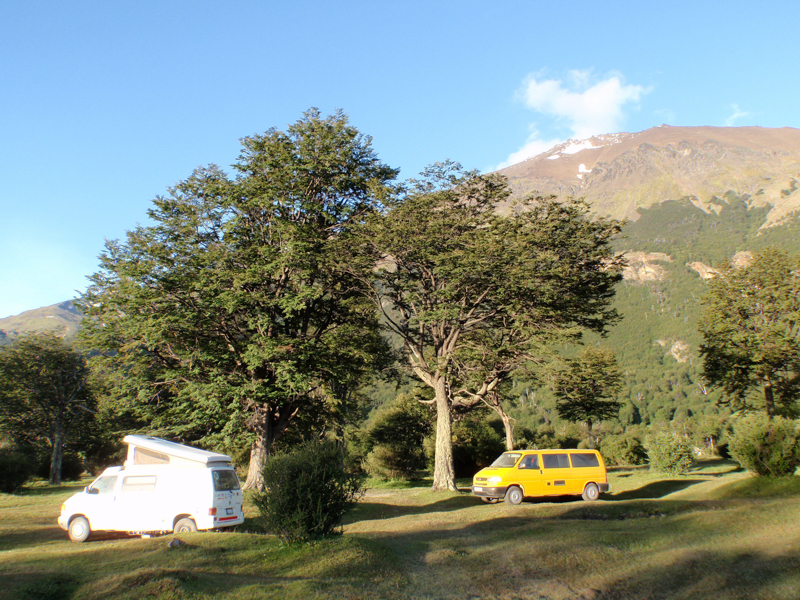 The Yellow Van leaves Tierra del Fuego… backwards! The problem with the suspension – there’s supposed to be a bolt to attach the end of the shock absorber to the van through the hole. Ours had sheered off, on both sides – too many 1000s of km on unfinished roads. Ok, we’ll spend the day sitting with this view for a rest day! The water in the lake is this colour because the glacier grinds rock into a fine powder which then stays in suspension – known as glacier milk. Peak season – the little ferry back across the lake was rather full with walkers and their rucksacks! Magnificent view from the cave – very useful for hunters! Starting our journey up Argentina’s other famous road – the ruta 40. Much of it is not yet surfaced, but they are working on it! And the wind down the valley, off the glacier, was so strong we simply weren’t able to go any further! But you need a close up to spot the climbers on the route! The rocks nearby have been scraped and shaped by the glacier moving to and fro over the years into amazing smooth round shapes. The colours of these rocks made them particularly spectacular – they looked like wood. Wearing a harness, you clip onto a pulley on the cable and haul yourself across. Becca needed a bit of help from a tug on a rope to get all the way over – it was uphill in that direction! But we got there, in time before we needed to turn around to get back to camp before dark (just)! And that Tyrolean – again! But this time slightly downhill! Back at the van, to find we’d left the lights on… again! It’s a legal requirement to drive with lights on at all times and we just keep forgetting to turn them off. It matters if you then leave it for 3 days! A Guardaparque (Park Ranger) to the rescue! Enjoy choosing and prepping – happy to answer any other questions and hope to meet you on the road one day!